Back in 1995, or rather, my year in Grade Twelve, our high school endured some renovations. I was on the rowing team, a team that trained all year via Ergometers (rowing machine), The Tank (and indoor pool), boats (in season), running and weight lifting. One of the areas of the school being renovated was the gymnasium, change rooms and weight room. The renovation would take months to be complete, so we looked to the 'GoodLife' Fitness Club down the road for our workouts. David Patchell Evans, owner of GoodLife Fitness and a former rower, sponsored our team during those months. We worked out in one of his London, Ontario clubs daily, until our school renovations were finished. That was my first experience with the GoodLife Fitness Club. I loved their variation of classes, their options of machines and free weights, plus a friendly staff who was willing to help whenever a question arose. Once in University, rowing Varsity, I worked out in the Varsity athletes gym. I still walked by a GoodLife Fitness location downtown daily, staring longingly at their windows and wishing my student budget would allow for me to be a member. The Varsity gym was nice of course, but it could do without all the football players. After an injury at the end of my first year, my workouts became less frequent and well, when you are in your twenties, who is really thinking about how healthy they are?? Years past. And this MommyO married and popped out two babies. Though tall and lean naturally, I still had work I could do to be healthier, and with my second child in Preschool three mornings a week, I made my way back to the GoodLife Fitness way of life. Those three mornings a week were glorious... and oddly, until I had them I never could have realized how much I NEEDED them. My heels pounding on the treadmill, the music in my ears lifting weights... the FOOD Network show on the television. I mean really, watching the FOOD Network while pumping the legs and arms on the elliptical just seems counterproductive, No? It doesn't really matter what I do while I am there, I've realized that GoodLife Fitness makes me feel whole. GoodLife Fitness makes me feel relieved of my stresses and surprisingly, the days I have my 'me' time to get my 'sweat on', are the days that I am a better MommyO and Wife. Of course I aim to be healthier, but sometimes the term 'healthy' may be more for the emotional well-being than for the physical one. I do not define myself in pounds, or in pounds of fat-- because, simply, the people at GoodLife Fitness do not see me like that, so nor should I. I know I am a fairly competitive and athletic soul from the get-go, but realize that not everyone who steps foot into the gym feels like that. I can honestly say that I love the heart of the GoodLife Fitness staff because they exemplify the clubs culture: caring, trust, integrity, happiness, peak attitude, passion and most importantly, personal fitness. Willing to help anyone out -- from using a machine, to working out a kinked muscle, the staff are amazing at what they do... and what they do is help you to feel awesome! If you have belonged to a gym that made you feel less than you are, then it is time to get a new gym. Join GoodLife Fitness for the GoodLife experience. With over 300 clubs across Canada, find out why GoodLife is the best life! in prizes from GoodLife Fitness and SportChek! January is all about the NEW! With many people resolving to start things off on the right foot, GoodLife and SportChek want to help you reach your fitness goals! Each week in January presents a new challenge -- for every challenge you complete, you will earn one ballot towards each weekly draw and be entered to win the Grand Prize! The more challenges you complete, the more chances to WIN! Write down your intentions.. what is your goal? What will you lose if the goal is not met? What might you gain? Week 2 finds you accepting the time your fitness goal will take. Be willing to take baby steps and realize there will be a few bumps in the road. But -- you can do it! 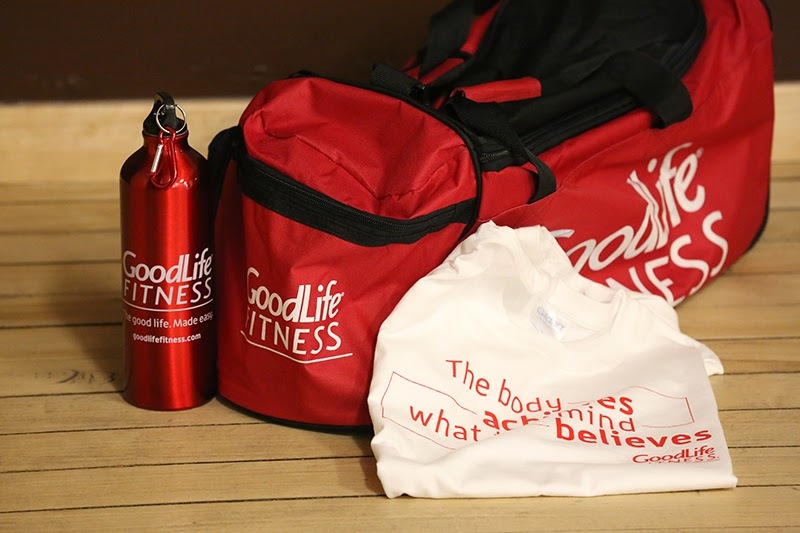 $5,000 worth of GoodLife Fitness Packages: Personal Training, memberships & more! $5,000 worth of SportChek gift cards to help you gear up for the next challenge! Being a member of GoodLife Fitness Clubs is an important step to my well being and health. I would love to help you start off your 2014 with a more healthy approach! Gym bag, T-shirt, Water bottle and a ONE MONTH MEMBERSHIP! Winner must be over the age of 18 and a resident of Canada to enter. (You may not win on more than one blog.) Please follow the rules of the linky below to enter. Giveaway ends, 12:01am MST January 31st, 2014.